Home / Agents of SHIELD / Marvel / Reviews / TV / [Review] - Agents of SHIELD, Season 1 Episode 18, "Providence"
[Review] - Agents of SHIELD, Season 1 Episode 18, "Providence"
Well true believers, if you stuck with Agents of SHIELD this long, in hopes that you'd one day glimpse Coulson in a toque, your perseverance has paid off. 'Cause there he is, his head all warm and such, traipsing around the "Canadian wilderness", which despite it being April, is a tundra-like wasteland (and yes, in real life, until a couple days ago, there was a substantial amount of snow still on the ground. And yes, yesterday it did snow in certain southern areas of the country). But traipse he did, along with every other bear-fearing member of his team, in desperate search of truth, salvation, and hidden Patton Oswalts (he's the best kind of Easter egg). So while SHIELD hunkers down below the barren regions of what might be northern Alberta (or Ontario, or BC, and I've now given the geography more thought than anyone on the writing staff), the Clairvoyant sets up shop under Havana (dichotomy!) and continues to be more appealing than any of the main cast. Oh, this show. Hit the jump for the review, which contains spoilers that are Agents of Something-Something. For 18 episodes, we few viewers the show has left have been moaning about how little integration it has had with the larger MCU. Well, the plot devices have come home to roost, because apparently an all out assault form Hydra was all that was keeping the dam from bursting. We've got Marvel all over these walls, now! In the wake of the Hydra assault, the show makes proper us of it's position, and clarifies the after effects of the film (as was the mandate of the series in the fans eyes from go). SHIELD has been labeled a terrorist organization, and despite retaining control of three (four) whole bases out of the seemingly endless and bizarrely named number they once had, is under direct threat from the US Government. Hulkbuster Glenn Talbot appeared long enough to put some scamper in acting-director Coulson's drawers, and have him high-tail it out of the Hub before the fuzz breaks down the doors. Meanwhile, in another jurisdiction, Garrett and Ward prove to be the most engaging characters on the show. I know. Their evil buddy routine is fantastic, with Paxton making mincemeat of the script. Every line sparkles when it's coming out of his mouth. He really is the anti-Coulson, with his reactions reminding us of Coulson's movie appearances and why we all fell in love with his every man routine in the face of crazy. Tied for moment of the night were his reaction to a fellow Hydra agent giving him the traditional salute, and his killing some folks earlier than expected for the sake of a good one-liner. The Girl In The Flower dress returned (though everyone seems to have forgotten that Deathlok is out there, somewhere, crying out of his robot eye maybe?) and looked as though someone killed her best puppy when she found out that the Clairvoyant was just a con-man rather than some mystical seer. I like the implication (as, it hasn't been made explicit) that Garrett is running all of this off the Hydra books. He admitted that he wasn't a true believer last week, and it remains unclear what his end game is. Though, the metal plate on his side might have something to do with it. I get the appeal of having a cyborg death machine at your beck-and-call, and I get why having some "Jesus juice" around would be helpful. But is he wanting to make money off of this stuff, or is he just looking to make general chaos? Whatever the reason, his heart of his shoes, the writers have done a better job in two episodes establishing the Clairvoyant's operation and operating procedure than they did with Coulson's team in the first half of the year. Ward was more interesting in ten minutes of this episode than he ever has been. He actually has a personality! 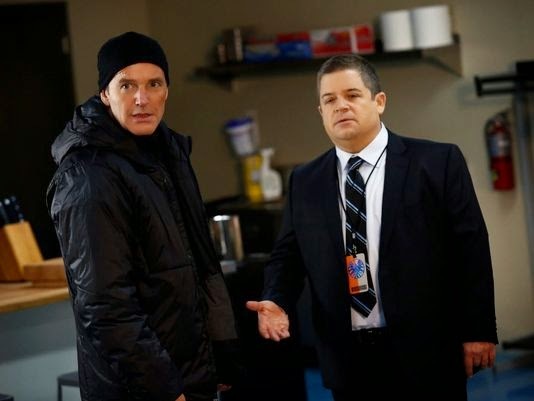 As does his replacement on Coulson's team. I like Trip, and hope they'll give him more to do than just be the guy no one trusts because he's new. At the same time though, as they are ingratiating Trip and showing us how bad Ward has been all along, I have to remind myself to give the show less credit. Because I'm spotting all the holes where they can wedge through Ward's "salvation." A heel-faced turn is probably coming, and I'd expect that from a show that has written most of it's episodes out of the cliche dictionary. Understand this, there can only be one outcome to this season: Ward dead, or imprisoned. There can be no redemption for this character, or rather, there shouldn't be. To double back on the one interesting thing they've done all year would be the latest slap in the face to the audience, but would also be in keeping with the way things have been. There have been occasional bursts of promise on this show and they have never risen to them. This will be perhaps the last chance the show has to do something right. A lot of ground was covered to further the plot, and it touched on the problem I mentioned last week, the idea of things reaching a critical mass. Because they waited so long to make things interesting, now there is so much interesting to get to, it's all happening at once. So, we had an excellent heist segment, where Garrett and Hydra raided the Fridge, stocking up on all the toys that Fury refused to send into the sun (I knew that was a stupid idea, and in retrospect, a waste of rockets). They also let loose a pile of villains that we've never seen before, plus probably a few of the three we did. As Garrett said, it should keep Coulson busy, which again, this show not big on the subtle. Meanwhile, Coulson had an emotional breakdown as the only structure he's ever known (and spent half this season speeching against) crumbed out from under him, only to reveal a secret hole full of toys and a popular internet personality. Credit where it's due, I loved Clark Gregg's reaction when Oswalt revealed he'd been down in the hole, alone, since the Battle of New York. Eric Koenig cleared up that Fury is alive, that Coulson was one of the few he trusted with that information (along with, apparently, a Level 6 - seriously, these levels mean nothing), and that Fury has prepared for SHIELD's collapse with a secret other-SHIELD infrastructure. Which means that the team will be able to keep gas in the bus in future episodes, rather than having to hitchhike from one exciting adventure to another like David Banner. It was a solid episode, which makes two in a row, but only by SHIELD standards. I still wouldn't say that it is good TV, and only time will tell how memorable it is. I doubt that a decade from now I'll be quoting this show, but it's becoming a better way to spend an hour on a Tuesday night.